This is for those who need a quick reminder about some basic rheology, with two apps explaining what viscosity is and how it changes with shear. This is an older version. For a more complete guide, go to my Practical Rheology pages. This is not intended as a course on rheology. 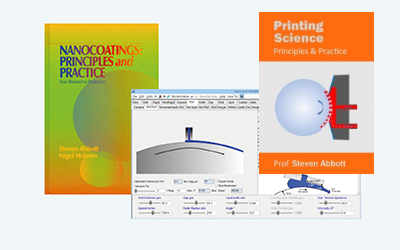 If you would like a quick guide then you can download the Abbott Rheology Guide The aim here is to "remind" you of some key issues that apply to coatings. Different parts of your process create different shear rates and therefore different viscosities. It is easy to estimate the shear rate for any given process. Squeezing an adhesive at 5cm/s from a nozzle that is 0.5cm diameter gives a shear rate of 5/0/5=10 while the same adhesive being squeezed as a 10μm layer at 0.1m/s gives a shear rate of 0.1/10-5=104. Enter the estimated shear rate and the relevant viscosity and shear stress are calculated. The equation blows up γ̇<1 so the value is fixed at η0 for these values. The reason some people use the power law curve is that they can provide a single number, sometimes called "P Ostwald", to use on, say, a product data sheet.